Jaisalmer exercise immense charm, but with the staging of the annual Desert Festival (January - February), it has also become one of the more important events on the annual calendar. Essentially, it is a showcase of the performing arts of the region on the stretching sands around this desert citadel. A number of amusing turban tying competitions and camel races. 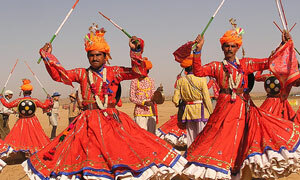 The Desert Festival is a 3-day extravaganza of colour, music and festivity, held at the golden city of Jaisalmer. Gair and Fire dancers swaying to traditional tunes, a turban tying competition and a Mr. Desert Contest are a part of the fun and frolic. The grand finale is a trip to the Sam Dunes where one can enjoy the pleasure of a camel ride and even watch the folk dancers and musicians perform. The perfect time to visit the golden city (Jaisalmer) is during the Desert Festival, held in Jan/Feb. every year, when the city reverberates to the sound of melodious tunes and rhythms. Folk dances, exciting competitions an contests, especially the turban-tying contest. Mr. Desert contest and camel races enliven the festivities. Colorful craft bazaars are set up for the occasion and a sound and light spectacle is organized wit folk artists performing against the splendid backdrop of the famous Sam sand dunes on the full moon night. Surely a not-to-be missed event.